At one mile in length, this has to be one of the biggest ‘bang-for-your-buck’ “hikes” in Oregon. I put “hikes” in quotes because it’s more like a casual stroll—to the point where I almost feel like I’m taking a flamethrower to a candle by strapping on a backpack, but that’s where all of my camera equipment is. 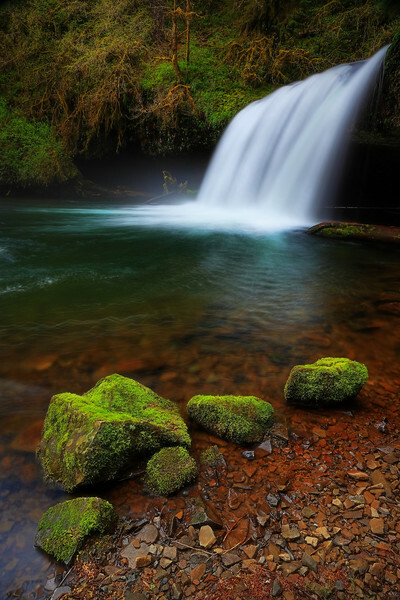 :) The lower falls is taller and twists and turns into a vast photogenic punchbowl, but due to sparser vegetation downstream, on this day Upper Butte Creek Falls stole the show. The veil was an impenetrable sheet of water that thundered to near-deafening levels as you approached, and here it felt like I was joining these five mossy fellows at a rock concert put on by Mother Nature herself.